The top 10 solar PV manufacturers had a declining market share in 2012 – and the Japanese are catching up with Chinese rivals. 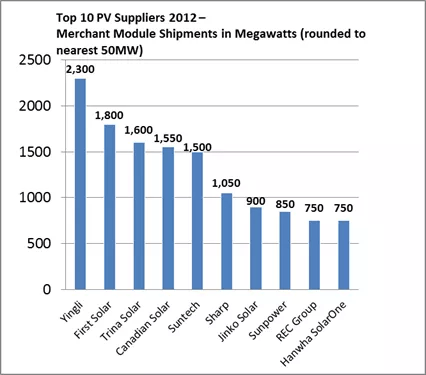 Market research firm IHS has released a report on the top solar module manufacturers of 2012. Regular readers may think this sounds familiar. If so, it’s probably because you’re remembering the Solarbuzz report on the top solar module manufacturers of 2012 that we reported on in February. For the most part, the IHS report agrees with the Solarbuzz report’s top 10 list. However, there are some differences. Nonetheless, some top 10 companies did grow market share. And a handful of Chinese solar module manufacturers – Renesola, Astronergy, Hareon Solar, and JA Solar — increased output considerably, by over 200 MW each. This article was first published at Cleantechnica. Reproduced with permission.